Income Tax laws are complex in many countries that to knowing multiple countries tax act provisions is very difficult. Many NRIs who work abroad, Foreign nationals who work in India need to aware of basic provisions that affect their tax compliance, and potentially to plan to reduce their taxes. 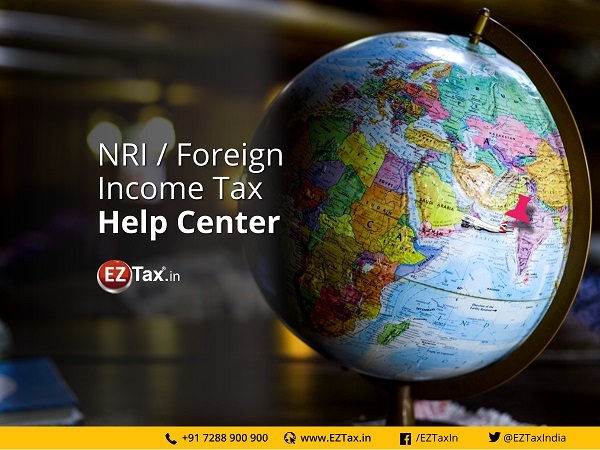 EZTax.in as a leading portal in providing tax filing solutions and CA Services, always in the forefront of educating NRIs and Foreign Nationals in this front. This portal is an effort to help you. Tax Provosions that every non-resident Indian or a foreigner living in India must aware in two parts. 'Non-resident Indian' is an individual who is a citizen of India or a person of Indian origin (PIO) and who is not a resident of India. The incidence of tax on any assessee depends upon his residential status. The residential status of an assessee must be ascertained with reference to each year. If taxpayer has been in India for a period of 60 days or more during the previous year and 365 days or more during 4 years immediately preceding the previous year. Exceptions: The following categories of individuals will be treated as residents only if the period of their stay during the relevant previous year amounts to 182 days. Indian Citizens who leave India in any previous as a member of the crew of an Indian ship or for purposes of employment outside India. Indian Citizen or person of Indian origin (PIO) engaged outside India in an employment or a business or profession or in any other vocation, who comes on a visit to India in any previous year. A person shall be deemed to be of Indian origin if taxpayer, or either of his parents or any of taxpayer grand-parents, was born in undivided India. Resident and Ordinarily Resident (ROR) or Resident but not Ordinarily Resident (RNOR)? Taxpayer is resident in India for at least 2 years out of 10 years immediately preceding the relevant year. Taxpayer stay in India is for 730 days or more during 7 years immediately preceding the relevant year. (*) ROR means resident and ordinarily resident. RNOR means resident but not ordinarily resident. Income from business connection in India. Royalty/fees for technical services received from Government of India. Royalty/fees for technical services received from resident is treated as income deemed to accrue or arise in India in all cases, except where such royalty/fees relates to business/profession/other source of income carried on by the payer outside India. Royalty/fees for technical services received from non-resident is treated as income deemed to accrue or arise in India if such royalty/fees is received for business/profession/other source of income carried on by the payer in India. In case of non-resident, being a person engaged in business of banking any interest payable by the permanent establishment in India of such non-resident to the head- office or any permanent establishment or any other part of such non-resident outside India shall be deemed to accrue or arise in India. Section 10 of the Income Tax Act exempts various incomes from tax in the hands of non-resident. Expert assisted Income tax filing for individuals with Foreign Income or Foreign Assets along with other Income such as Share trading Income or Loss, and/or Sale of properties, along with single or multiple house properties, single or multiple Form-16s, and interest income. Expert support through Email, phone & chat during the business hours. Upon receiving the documents, our expert will call you before starting the process. Expert team will exchange the information through email and phone calls, if necessary. Team will send you the Draft Computation Sheet for further review. Once confirmed, team will e-File your return, and send you the ITR-V acknowledgement. PAN Card Copy or related information. Full Address or Aadhaar Copy. e-mail ID & Mobile Number. Bank Account Number & IFSC Code. If it is a sale of property, below details required. Sale value, purchase value, sale price, purchase price. Any other incomes, Investments or Savings details. Form 26AS or Income Tax Login Credentials. Need a different Plan ? 1.What are the deductions allowed and not allowed to NRI? 2.How to calculate the residential status? 3.What is tax consideration of NRE/NRO Account? Considering the interest income in NRE / NRO Account, NRI can file their return in India. Income of NRE Account shall be exempt whereas, Income in NRO Account shall be taxable. 4.Why ITR should be filed by NRI? If the Tax deducted at source is more than the actual tax liability of the NRI, then refund can be claimed by the NRI only after filling return along with interest. If the NRI has incurred any loss on sale on sale of investments (either short term or long term) than NRI can carry forward the losses to future years. Having details of the documentation of all the Income and Assets in India and in Foreign Country will help the NRI in complying with the Repatriation Rules for Income and Assets held in India and also when the NRI return to India. 5.What are the tax exemptions incomes for NRIs? 6.What is tax treatment to NRI on capital gains and setoff capital gains against the basic exemption limit? Residents can set-off LTCG against basic tax exemption limit but non-resident can’t avail the basic limit. Short Term Capital Gains on the sale of Debt/Gold/Real Estate etc. Short term Capital Gains income will be taxed as per income tax slab rates Set off against basic tax exemption limit short term capital gains of any capital asset (other than equity) is permitted for both resident and non-residents. Short term capital gains on the sale of debt funds/property Rs.3, 50,000 and other income of Rs.50, 000 and total income for the year is Rs.4, 00,000(including short term capital gains). The entire income will be taxed as per income tax slab. Then taxpayer has to pay tax of Rs.7, 500 (irrespective of residential status). Long Term Capital Gains on sale of Debt/Gold/Estate etc. Rate of taxation is 20% after indexation or 10% without indexation depending upon the type of asset. 7.What is DTAA and how to apply DTAA? The non-resident Indians (NRI) lives abroad but also earn an income in India. In this case, there is a possibility that the income arise in India would attract tax in India as well as in the country of the NRI’s residence. This means that taxpayer would have to pay tax twice on the same income. To avoid this twice payment of tax something called Double Tax Avoidance Agreement (DTAA). The benefits of DTAA are lower withholding tax (tax deducted at source or TDS), exemption from tax, and credits for taxes paid on the doubly-taxed income that can be encashed at a later date. India has DTAA with over 80 countries. The major countries with which it has signed the DTAA are the United States of America (USA), the United Kingdom (UK), the UAE, Canada, Australia, Saudi Arabia, Singapore and New Zealand to name a few. Trusted, Secured, Accurate, with Privacy. Call us, Chat with us, or drop an email to us Today to help you. I filed my NRI filing with EZTax.in last year and their support team is the best I experienced so far. Despite I was in USA, they are able to accommodate the communication and coordination.